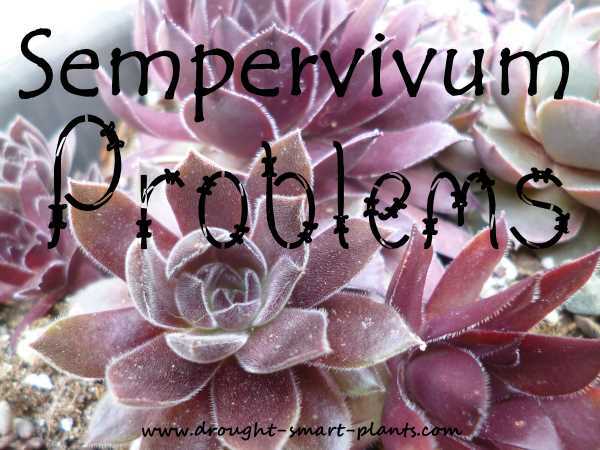 Fortunately, Sempervivum have very few problems that aren’t caused by some mishandling of their environment. 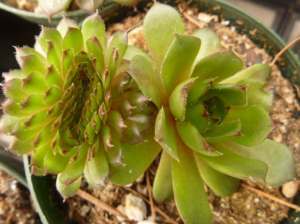 Give these hardy succulents the right conditions, and they will seldom have trouble with pests or insects. Sometimes, however, they can be susceptible to certain problems; I’ve noticed first thing in the spring, they are obviously really attractive to rodents, deer and rabbits, who crave those first succulent greens. When they can’t find any, they turn to your Sempervivum for a quick boost. The lust to eat them is short lived, and once the snow is gone, they move on to greener pastures. Those rosettes that are damaged can quickly rejuvenate themselves, and in a month or two, the damage is grown out, and you would never know that they had once been lunch. Deer tend to browse them right down to the roots – and you would be excused for thinking that they’re doomed – but don’t give up too soon! Leave them in place, and you might be amazed to see tiny green sprouts coming back. 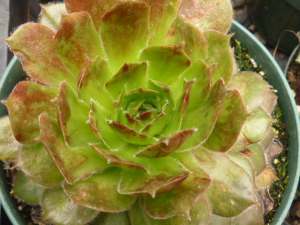 Other issues that sometimes afflict hens and chicks are caused by extremely wet conditions. One of the telltale signs of this problem are what I call Droopy Drawers, where the leaves try and lever the plant right out of the soil, as though it's on stilts. They are susceptible to root rot if the soil is soggy and holds too much water – these are hardy plants, but they can’t withstand wet, especially in the winter. This will show as blackened leaves on the bottom of the rosette. If all else fails, take the plant out of the pot, and dry it out quite severely. Most plants can’t survive this treatment, but Sempervivum are so amazingly tough. If the roots have root rot, cut the whole thing off, and let it re-root by setting it on top of some dry potting soil. In a few weeks, the new white roots will show. ,On some plants that I got from someone else, I noticed last fall that they didn’t seem to be recovering from their long journey in the mail as quickly as I would like; when I looked really closely, I saw that they had tiny aphids. After spraying them with insecticidal soap a few times, I felt confident that they would recover. However, on closer inspection this spring, many of these are now showing signs of virus, which indicates its presence by blotchy marks on the foliage, and twisted or deformed growth. Cull these immediately, don’t give the virus a chance to spread to healthy plants. The vector, what else? Aphids, farmed by wasps. If you see hornets hovering around the plants, give them a look under the magnifying glass. 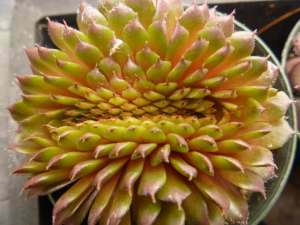 In a weird twist, some Sempervivum seem to have a tendency to fasciation. This means that they mutate into strange forms, in some cases into a fan. Oddly, only some of the chicks show this type of mutation, which tells me it’s probably not something that is spread by insects, but in the cellular DNA of the plant. Luckily, these plants seldom get diseases, or have other issues, and when they do, it’s amazing what a change in cultivation methods or soil will do. Kathryn asked me, is it possible to give a Sempervivum too much light? Read what I told her. Find out what happens when your Semps get too much water - they get Droopy Drawers.